This dish is so delicious and easy you won't believe it! 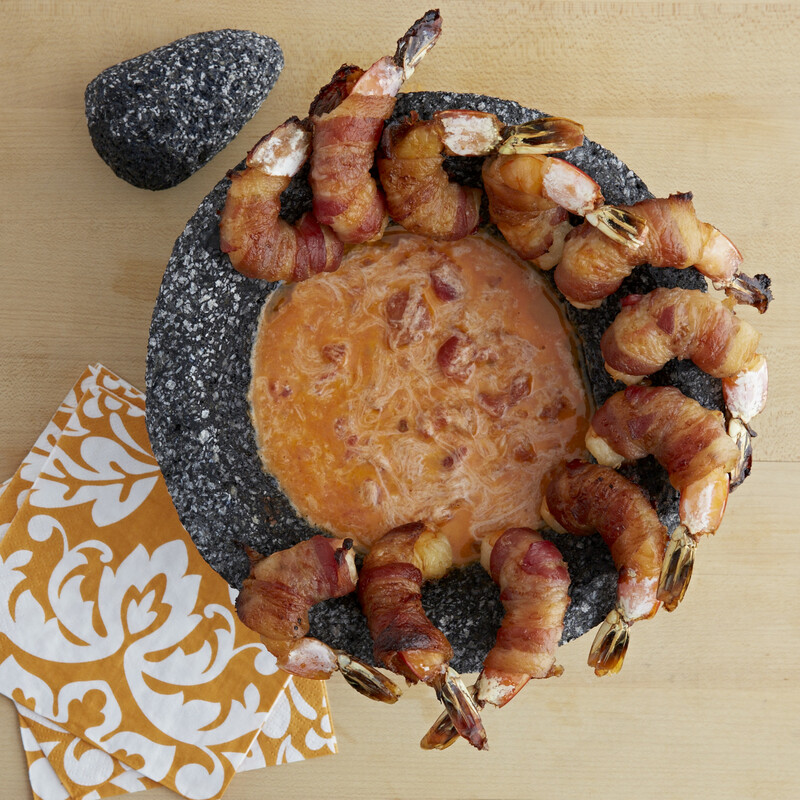 This recipe uses brown sugar to caramelize the shrimp and has layers of flavors from shallots, thai chiles, siracha sauce, and Asian fish sauce! 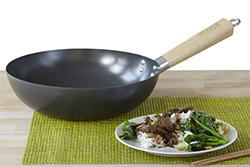 Heat the oil in an IMUSA wok over medium-high heat until it smokes lightly. 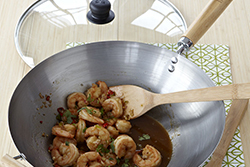 Add the shrimp and the brown sugar and stir-fry for 2 to 2 ½ minutes. Add the garlic and shallot and stir-fry for another 2 minutes. Let this boil down until the sauce has thickened and reduced by half. This should only take a few more minutes. 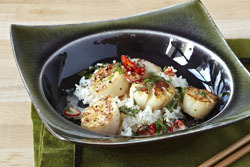 Serve immediately topped with freshly chopped cilantro with some jasmine rice. This dish has the perfect combination of spicy and sweet - using fresh red chiles and coconut milk to make a delicious sauce for the sea scallops. Who said veggies had to be boring!? Using a dipping sauce made from pineapple, vinegar, and sugar adds a sweet and tangy flavor to your steamed veggies. 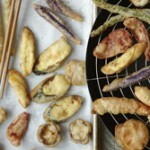 Place vegetables inside the IMUSA steamer baskets and bring 2 cups of water to boil in a wok or medium saucepan. To make dipping sauce, in a small bowl or cup add ice water and cornstarch and mix until fully dissolved. Set aside. Remove juice of canned pineapple, about ¾ cup, and place in a small saucepan. Reserve pineapple chunks for other use. Add vinegar, sugar and salt to saucepan and heat on medium high, whisking frequently. Once simmering, drizzle in cornstarch mixture and whisk briskly until sauce thickens. Remove from heat and pour dipping sauce in a bowl. 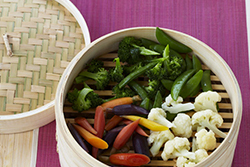 To steam the vegetables, place steamer baskets with veggies on wok or saucepan and steam for 4-5 minutes. Remove immediately and serve with sweet and sour dipping sauce. This Mongolian Beef recipe uses flavorful flank steak in a savory rich brown sauce that brings Asian flavor to your kitchen! 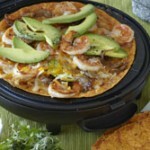 Pair with steamed broccoli and jasmine rice! Slice the flank steak across the grain into very thin slices (it helps to place it in the freezer for about 30 minutes). Combine all the remaining ingredients except the scallions and brown sugar to make a marinade. Combine the sliced flank steak and marinade in a large zip lock bag or a bowl that accommodates both. Allow to marinate for 1 hour and up to 4. Heat an IMUSA wok over medium high heat. Add one tablespoon of the peanut oil and allow it to heat until it is mildly smoking. Add the scallions and quickly stir-fry for 2 minutes. Remove from wok and set aside. Drain the flank steak well (DO NOT DISCARD MARINADE). Pat the flank steak dry with a paper towel. Add half the marinade to the wok and bring to a boil. Allow it to boil until it is reduced slightly and thickened. Add the flank steak back into the wok and sprinkle with brown sugar. Continue to stir-fry for 2 additional minutes. Add the scallions and stir until combined. Serve over steamed jasmine rice. It's all about the marinade! 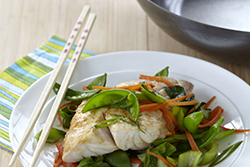 This recipe flavors snapper with a miso paste, ginger, and scallion marinade and a separate vegetable marinade made with peanut oil, rice wine vinegar, soy sauce, and sesame oil. In a large bowl, combine peanut oil, rice wine vinegar (not Mirin), soy sauce and sesame oil. Toss vegetables (except for the bok Choy leaves) in the marinade. In a separate bowl, combine miso paste, mirin ginger and scallions. Pour marinade over fish. Allow both the vegetables and fish to marinade for at least 30 minutes and up to 2 hours. Place a bed of bok Choy in the bottom of the steamer and place the marinated fish over it. Discard excess marinade. Place steamer over a 14 inch IMUSA wok with 2 inches of water. Bring water to a boil over medium high heat. Once water is boiling and steam is visible reduce heat to medium and continue cooking for 10 to 12 minutes. Turn off heat and remove steamer from wok. Place bamboo steamer over a large plate and serve with jasmine rice.